A couple of questions / issues when using Datatables in combination with Parcel bundler. I am quite new to bundlers, especially Parcel. So apologies if I misunderstand the instructions. I used the Datatables download tool (1. framework: DataTables, 2 packages: jQuery 3, DataTables; extensions: Buttons, HTML5 export, JSZip, pdfmake, Print view, Responsive, Select). When using download method CDN everything works as expected. 1) CSS is not loaded? I don't see any Datatables CSS being loaded. None of the buttons are displayed / visible in the source code. I tried @import 'datatables.net-dt' but that had no effect (CSS still not loaded). I don't get the mentioned error message (main.css:2.1). It refers to a blog post, I have the feeling that was not created yet? Frustratingly yes. I've tried Parcel out a few times myself and as of yet haven't been able to make it load styles from the modules (e.g. just using @import 'datatables.net-dt';). The information for that is in the package.json file, and what I've read suggests that it can be made to work, but I've not found the right combination to make that work in Parcel yet. That's why I've not yet published a blog post about it. I'd need a link to the page showing the issue to be able to help debug that one. Actually the same with the others. Could you publish the result on the web somewhere? Sorry - I missed your previous reply. Thanks for the repo. Indeed require is not a built in method. You would need to use an AMD loader such as RequireJS there. However, in the HTML you have the CDN lines commented out - you could just use them and drop your require lines to have the table render as expected. No worries @allan . Thanks for looking into it. Not sure I understand what you write. I am using Parcel to serve the page: parcel index.html (serves it on port 1234). 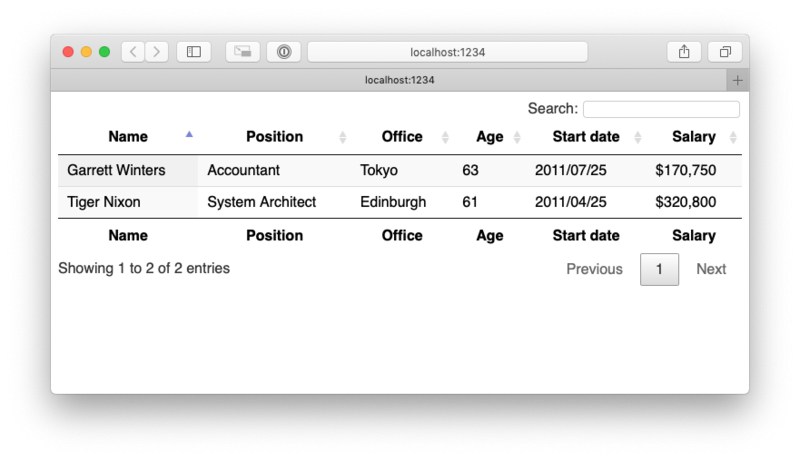 I don't get an error message in the inspector, and the table itself renders fine (see footer, sort arrows and search field). See screenshot. The commented out CDN code was to show that the equivalent CDN does work. The goal is to not use CDN but use Parcel to bundle it all. That's what the 4 issues are related to. Hi @allan, did you get a chance to look at this? Sorry - I hadn't clicked that you were using Parcel with the repo. Are you simply doing npm install; parcel index.html or something else? But in the generated stylesheet that results in nothing being imported. I filed this feature request on Parcel a while ago, but it looks like it hasn't been implement yet. Perhaps some votes for that feature would help. Hi @allan , sorry, unclear to me what you are doing differently and if things are indeed working. b) indeed, @import 'datatables.net-dt'; should be enough, I believe you confirmed that this is the workaround until that issue is resolved: @import 'datatables.net-dt/css/jquery.datatables.css';. With the workaround I get the correct DataTables CSS, but still have the other 3 original issues.